I know what you’re thinking: What is Princess Vespa without the unmistakable spark that Daphne Zuniga brought to the role? 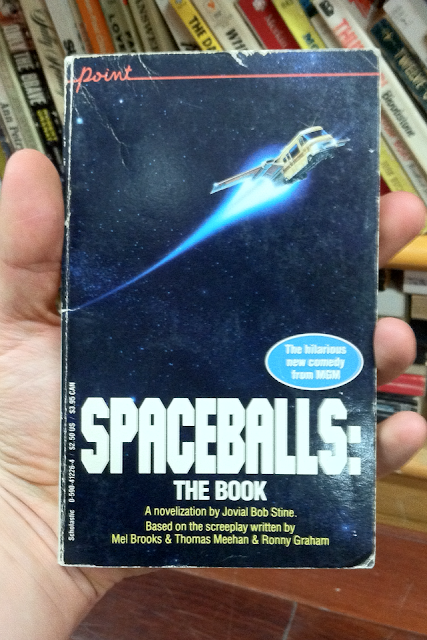 But the takeaway here isn’t the proof that someone at some point adapted Spaceballs as a novel. No, it’s that one person in particular did: Jovial Bob Stine. He also made book-like-things out of Ghostbusters II and Big Top Pee-wee, but you probably know of him for different reasons. The same author wrote a great many more books under the name R.L. Stine, including the whole of the Goosebumps series (yes, yes, “mah fravrit berks”) as well as the Fear Street series, which I never read but which I will always remember for their bumpy-textured covers depicting ambiguously unhappy teens at night. I actually know very little about R.L. Stine. The Goosebumps books only became a thing right when I was growing out of them, and I felt the older-skewing titles threatened my adolescent masculinity, what with their relatable heroines and approachable-seeming male love interests with their tucked-in shirts. But looking at this guy’s collected work, I realize he’s a freaking Stephen King for the puberty set, exorcising this bit of nascent existential angst and that bit of hormonal confusion with near-horror, semi-suspense and the mild macabre. It’s actually almost impressive that he actually exists — you know, as opposed to Franklin W. Dixon or Carolyn Keene — and this one guy actually thought up so many technically different nightmare scenarios for young people. Then again, in complete contradiction to the that last statement, there are the synopses to R.L. Stine’s Babysitter tetralogy to suggest that such a body of work could be amassed by any idiot with a rainy afternoon and a pair of dice with stock plot devices taped to them. The Babysitter: Sixteen-year-old Jenny Jefferes receives threatening calls while she is babysitting, and the person making the threats turns out to be Mr. Hagen, the father of the boy she’s watching. He hates babysitters because an inattentive one accidentally killed his daughter. Mr. Hagen initially offers to take Jenny home but instead takes her to a rock quarry where he tries to kill her but then fails to killer so badly that he himself dies. The Babysitter II: Suffering from nightmares about a zombified Mr. Hagen rising from his grave, Jenny has begun to see a psychiatrist. While babysitting a malevolent boy genius, her psychiatrist’s receptionist attempts to kill her. The Babysitter III: Jenny goes on a babysitting outing with her cousin, Debra, when threatening calls begin again. Then Debra finds out the calls are coming from Jenny, whose mind has been overtaken by a “Mr. Hagen” personality. The Babysitter IV: Jenny attempts to put her dark babysitting-related history behind her by accepting another babysitting job. She is terrorized by murderous ghost children.